Fourth of July is coming! Time for a cookout with all the trimmings. Wet pool towels drying on the railing. Burgers on the grill. The table loaded with corn on the cob, watermelon, baked beans and potato salad. That warm-from-the-sun happy feeling that can’t be duplicated in any other season. Only summer gives us this. 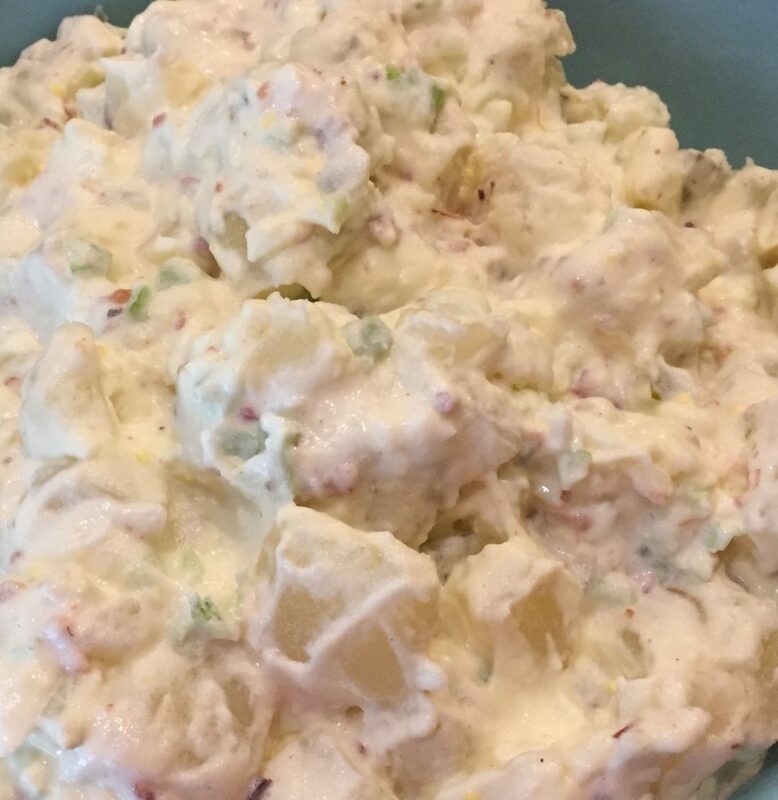 Today I’m making potato salad. It’s not quite July 4th yet. June 29th to be exact. This has been a busy week. My mother-in-law had knee surgery and came home from the hospital today. I wanted her to have a homecoming with as much of the above as I could give her. 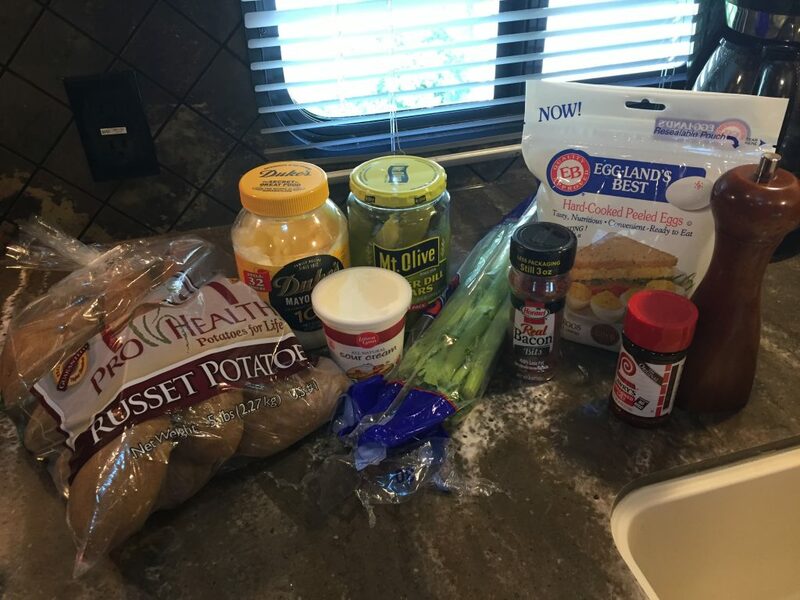 So we are having burgers and baked beans and potato salad. I’m taking two shortcuts to make my prep a little quicker so I can get this in the refrigerator. If you want to fry your own bacon or cook your hard-boiled eggs, do that now. When possible, I like to use a shortcut while cooking. Buying these two items saves me time and can be used in other recipes as well during the week. Sauce can be made first or while you are cooking the potatoes. I make it first because I don’t like to rush. 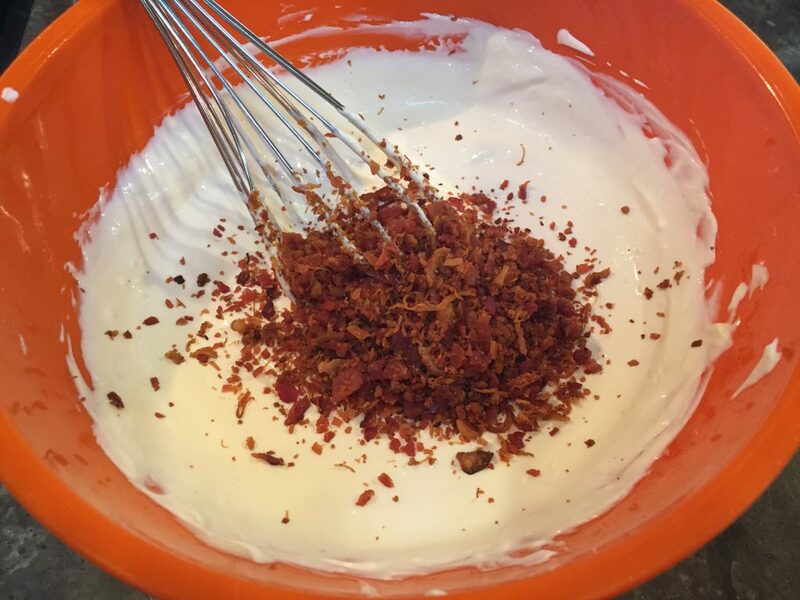 Combine sour cream and mayonnaise in a bowl with a whisk or spoon. I only use Duke’s mayo but I was raised in the south. Do as you wish. Stir. Add green onion if you are using it. You can cut it directly into the sauce using kitchen shears. I didn’t use any today because my mother-in-law doesn’t care for it. 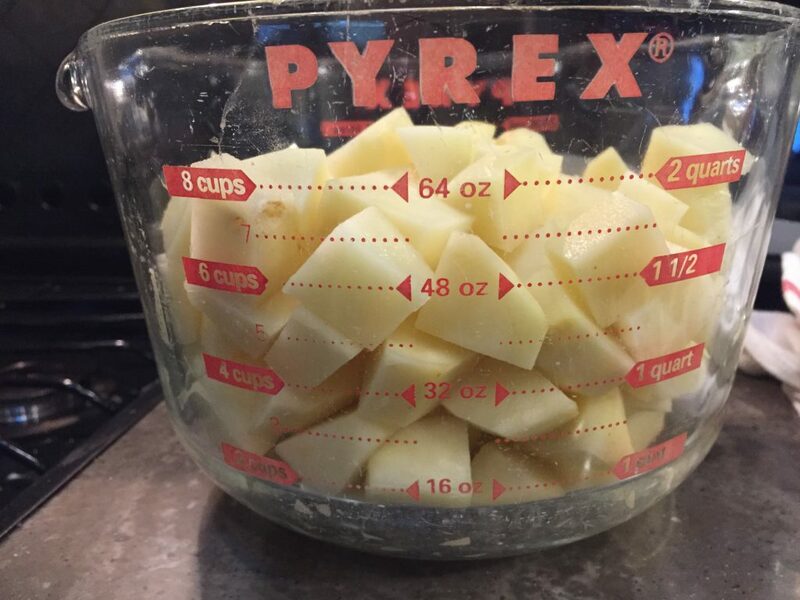 Rinse, scrub, peel and chop potatoes into bite size pieces. 3# of russet potatoes gave me 8 cups of chopped potato pieces. You can use other kinds of potatoes but small potatoes are harder to peel. Place potato pieces in a medium or large pan over medium-high heat, covered with cool water. When the water begins to simmer, cook for around 15 minutes. Test for doneness by spearing a potato piece with a fork. If the piece spears easily, it should be done. Lay the test piece on the counter and let cool. Eat it! If you really don’t want to eat it, you can also smash it with a fork – looking to make sure it looks completely smashed – like mashed potatoes – all cooked. If it is no longer raw, remove the pan from heat. Pour off the hot water or pour potatoes into a colander. Let steam for a few minutes to remove some moisture. 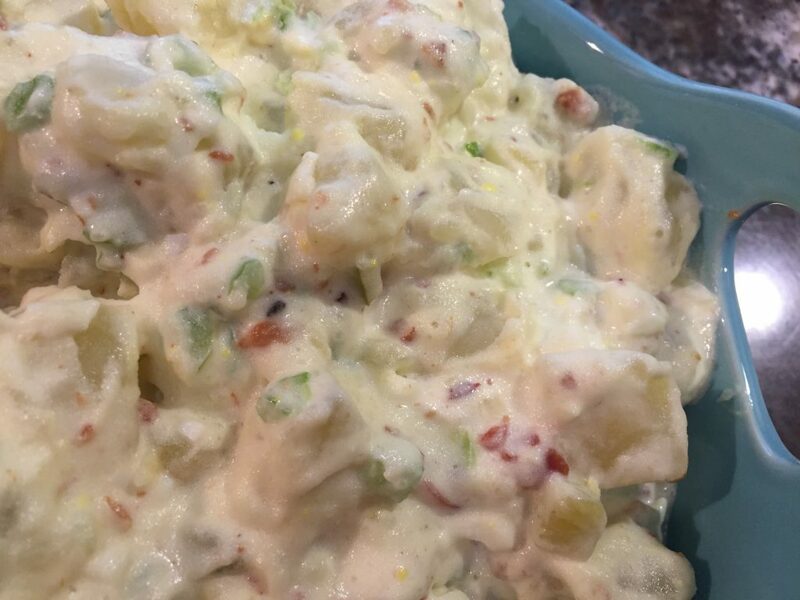 Then pour hot potatoes into the mayonnaise sauce and gently mix. Refrigerate immediately for several hours or overnight. Taste before serving and adjust salt if necessary. 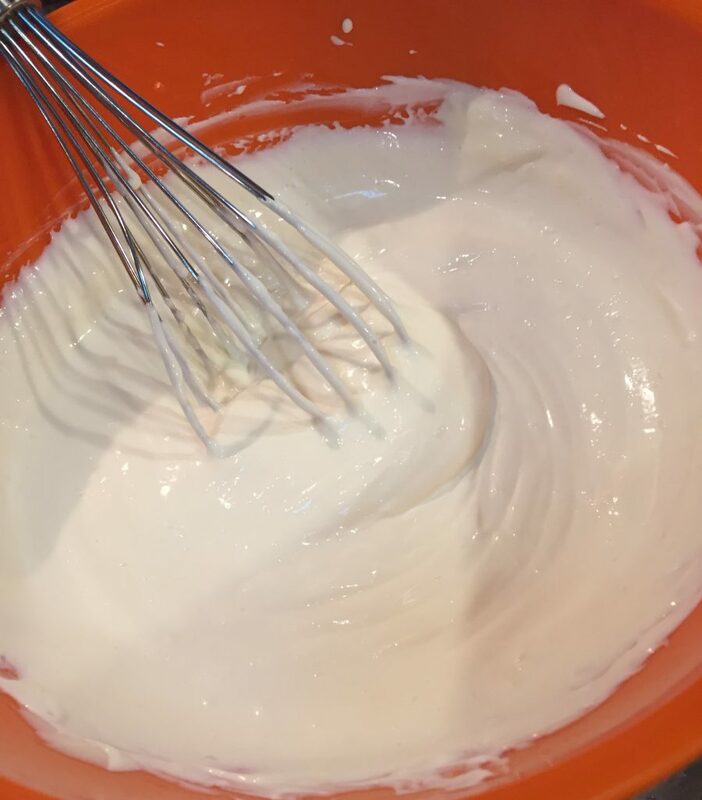 Combine sour cream and mayonnaise in a bowl with a whisk or spoon. I only use Duke’s mayo but I was raised in the south. Do as you wish. 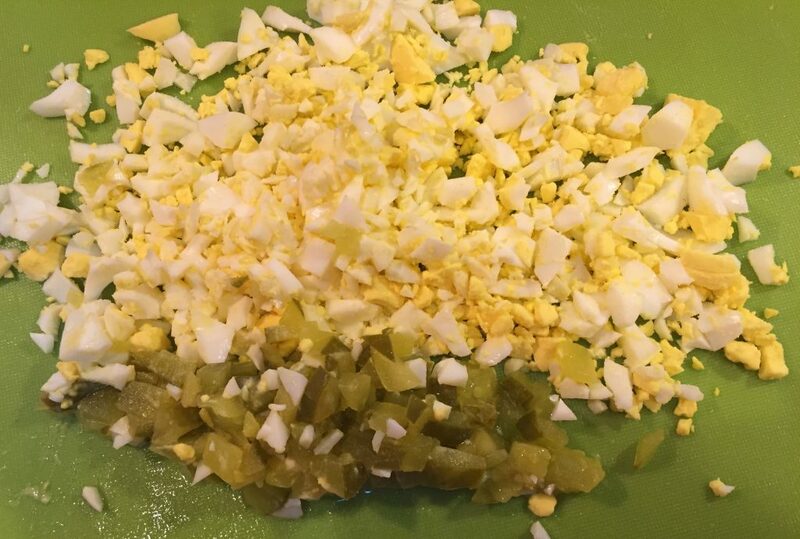 Add in bacon bits, chopped eggs, finely chopped celery, finely chopped pickle, pickle juice and salt and pepper. Stir. 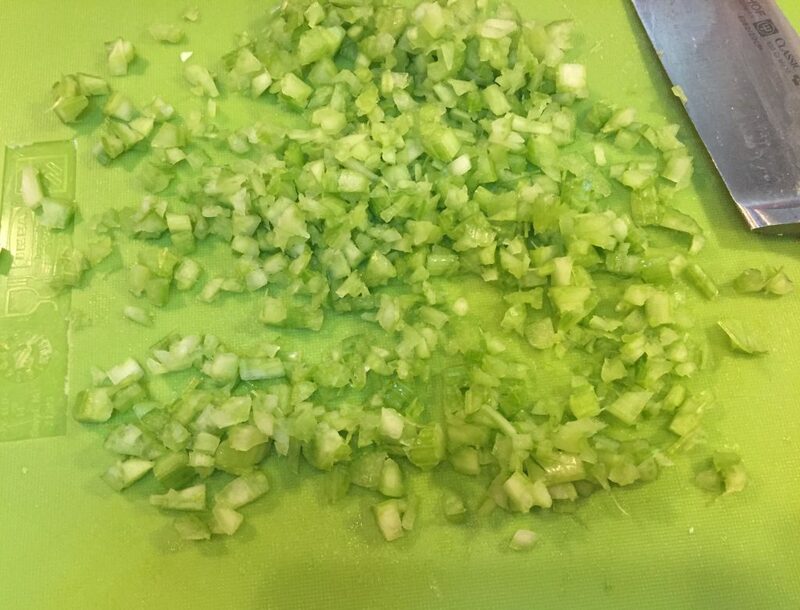 Add green onion if you are using it. You can cut it directly into the sauce using kitchen shears. Rinse, scrub clean, peel and chop potatoes into bite size pieces. 3# of russet potatoes gave me 8 cups of chopped potato pieces. You can use other kinds of potatoes but small potatoes are harder to peel. 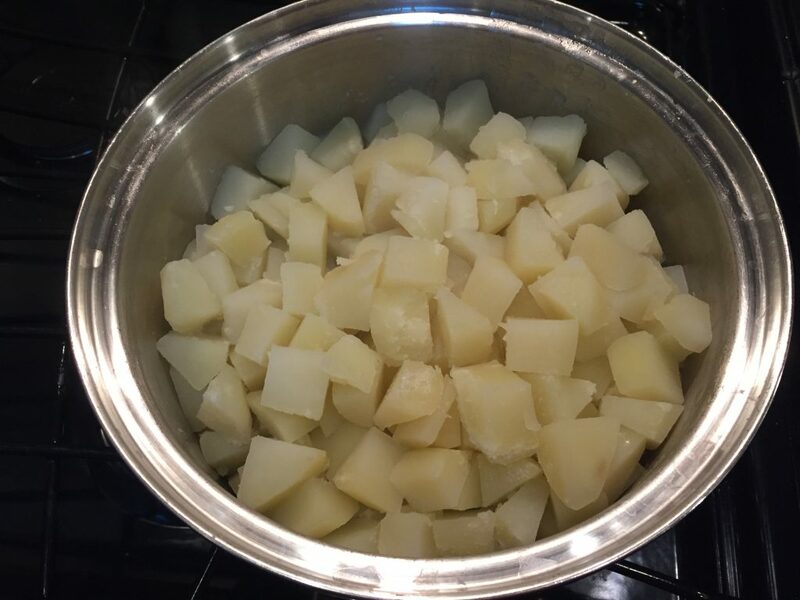 Place potato pieces in a medium or large pan over medium high heat, covered with cool water. When the water begins to simmer, cook for around 15 minutes. Test for doneness by spearing a potato piece with a fork. If the piece spears easily, it should be done. Lay the test piece on the counter and let cool. Eat it! If you really don’t want to eat it, you can also smash it with a fork – looking to make sure it looks completely smashed – like mashed potatoes – all cooked. If it is no longer raw, remove the pan from heat. Pour off the hot water or pour potatoes into a colander. Let steam for a few minutes to remove some moisture. Then pour hot potatoes into the mayonnaise sauce and mix gently. Refrigerate immediately for several hours or overnight. Taste before serving and adjust salt if necessary.